There are few topics that are as controversial in motoring circles as the subject of how to run in a new engine. This is my take on running in a new engine and I have found over the years that it has done me in reasonable stead. An engine that is poorly run in will not develop as much power as it could and its lifespan may even be shortened measurably. Lets start by talking about what running in, bedding in or breaking in an engine is all about. 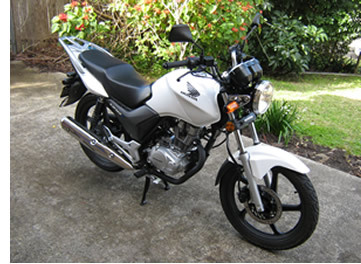 Then I'll give the world my take on it as it relates to the Honda CB125E and you can decide for yourself how you would like to go about it. I will try to keep this article short and sweet. When a piston engine is first manufactured the mating surfaces inside the engine most responsible for cylinder seal, that is the cyclinder wall and the piston rings, have microscopically rough surfaces that do not sit well against each other. As the engine is used these surfaces slide against each other and wear the peaks and troughs from machining off and start to match each other. They kind of rub against each other until they get the right shape and start to smooth out together. Now its about this point that the controversy starts! In some schools of thought the best way to run in an engine to ensure good cylinder seal is to ride moderately and at low engine speeds for the first 500km. I do not agree with this perspective as I feel that the mating surfaces will simply end up polished and may not seal as effectively as they could. The train of though that I prescribe to is somewhat different. The piston rings seal by gas pressure from the combustion process getting behind them and forcing them against the cylinder wall. The cyclinder wall itself when freshly honed will be fairly rough and when the rings are forced against them under wider throttle openings the contacting surfaces will initially wear at a slightly higher rate and in such a way that they will seal against each other more effectively. High spots will be removed and the outer edge of the piston rings will match the bore more closely. So how did I run my motorcycle in? Well, the beauty of a small bike is that you can run it through the gears without finding yourself travelling at 200km/h. In fact, if you want a CB125E to travel this fast I can only suggest you put the bike on a trailer and attach it to a porsche. Alternately, consider recycling the bike into an artillery shell and firing it out of a canon. I ran my bike in on suburban streets in 50 and 60km/h zones. First and foremost, on the first ride and every ride until the bike has travelled at least 500km, the bike should be warmed right up before you ride it. Once at running temperature its time to ride! The first 20km or so that the bike is ridden will be where the majority of the bedding in process takes place. You might even decide to change the oil at the 30km mark, something I wish I had done in hindsight. Anyway, for the first ride you will find that the motor does indeed feel tight and reluctant to rev. Start off moderately in first gear and then change to second gear. In second gear give the bike wide open throttle and change through the gears at about 10km/h under the shift points on the speedometer until you are travelling at 70km/h in fourth gear. Roll right off the throttle and decelerate, changing gears so that the engine revs healthily on each backchange. Repeat this four times, starting off moderately in first gear and powering through second, third and fourth gear. After performing this four times you will actually feel a difference in the engines willingness to rev. Now where does the 50km/h and 60km/h zones come into it? Well, you may have noticed that riding around the suburbs is not a constant affair, you will find yourself slowing down and speeding up for roundabouts, crossings and intersections. Just ride as you normally would, accelerate briskly at around 1/2 - 3/4 throttle and decelerate smoothly. At intervals perform the wide open throttle effort described in the previous paragraph. Perhaps a couple of passes every 10km. The benefit you get from the wide open throttle treatment declines as the motor runs in and by 100kms or so it will not be required. In my opinion its greatest benefits are achieved during that very first ride where you did it four times in a row and many mechanics suggest that after the initial four passes thats as good as its going to get. After the motorcycle has travelled 600km it can be considered to be run in and subject to whatver you consider to be normal riding, though it will continue to loosen up for some time yet. What to avoid - Running at a constant speed, especially in top gear and especially at full throttle. Full throttle launches in first gear arent very desirable either, the idea is to load the engine up so that the rings are forced against the cylinder wall and first gear will not achieve this for an acceptable length of time. Cruise through it and go for second. Also avoid labouring the engine, particularly up hills, change back to a lower gear that the bike feels comfortable climbing in. Oil change intervals can be important with a new engine. I changed my oil at 500km intervals until the bike had travelled 2000km. After that the oil was changed at the 3500km and 5000km marks. From 5000kms onwards I change the oil every 2500km. Use a mineral oil of the correct grade until the bike has travelled at least 2000km, synthetic oils are just too slippery to bed an engine in well with and are probably best avoided early in the motorcycles life. Well, thats my take on running an engine in. It seems to have worked well for me over the years. But running in is a controversial subject.